Results of the study confirm that using the m-health Happyair program improves adherence in patients with COPD and their perception about following the program is very positive. Healthcare professionals demonstrate their satisfaction and are also positive about the benefits for patients enrolled in the program. COPD, Chronic Pulmonary Obstructive Disease affects more than 2 million people in Spain. According to the World Health Organization, WHO, COPD is the 4th leading cause of death worldwide and it is estimated that by 2030: 7,8% of deaths worldwide will be caused by COPD. The study, “ The results of tele- monitoring using m-health in adherence to an integral care plan, including physical activity and respiratory therapy in patients with COPD” carried out by the Lovexair Foundation: evaluates the disease from different perspectives: on the one hand, the benefits to respiratory disease patients who are enrolled in a comprehensive digital healthcare program, on the other hand ,the benefits for healthcare professionals with access to resources supplied by the Lovexair Foundation , as ICTs and support services of trained educators who work with patients and follow their disease-management program. 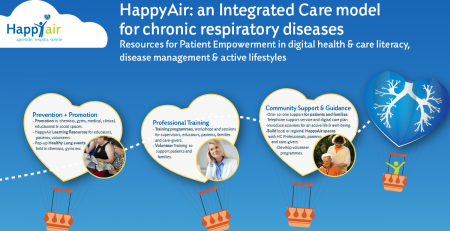 The m-health program is an integral part of the Happyair initiative developed by the Lovexair Foundation and registered in the EIP AHA (European Innovative Partnership for Active Healthy Ageing, Action Group B3 for Integrated Care ). 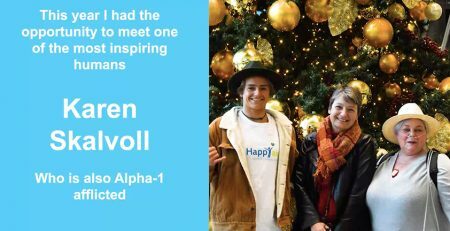 The first seeds of this project were developed more than 6 years ago by Lovexair as part of our key mission to provide evidence-based and meaningful solutions, to attend to Society’s needs where the impact of ageing populations affected by chronic disease is becoming an enormous burden to our future well-being, health and care as well as productivity. 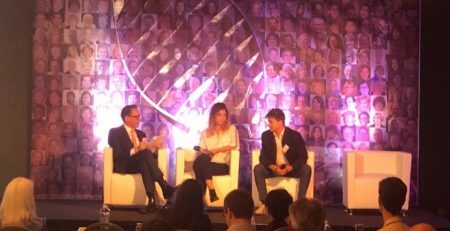 We have developed the m-health program in direct answer to patients, care-givers and families demands to have access to better resources for self-management , receive pulmonary rehabilitation or suitable exercise in order to have better quality of life, inspite of facing fewer resources available in healthcare systems or in low-cost environments in developing countries. We also address patient’s desires to be guided by trained healthcare professionals in their own environment. 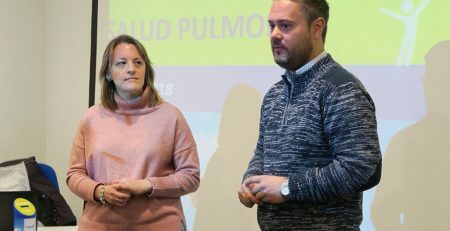 The clinical intervention study was carried out between 2016-2017 in 3 leading hospitals in Madrid (Hospital Clínico San Carlos, Hospital Universitario Doce de Octubre, y Hospital Universitario La Princesa) where a multidisciplinary team of healthcare professionals from each hospital, collaborated with Lovexair. Patient volunteers were recruited with COPD at Grade II, III and IV GOLD standards and an average age of 69+, in a clinically stable condition. 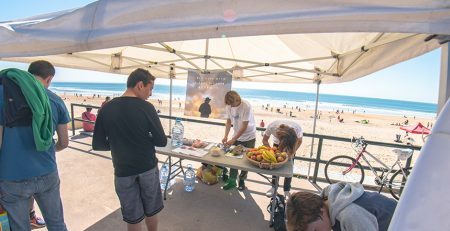 A third of the participants were oxygen users. The Foundation developed the intervention model under the guidance of a number of expert healthcare professionals. We were able to apply a basic protocol to introduce a lung-care and exercise plan but were not allowed any education on disease management, by the ethical committee to verify the value of tele-care support and the app as a daily reporting tool for self-care on its own basis. The ICT resources (smartphones, devices, app and clinical platform) and technology necessary was supplied and managed by the Foundation with their own personnel and a third party e-health provider. The patients were separated into two groups: control and intervention. Both groups followed an 8 week pulmonary rehabilitation program in their own hospital setting. 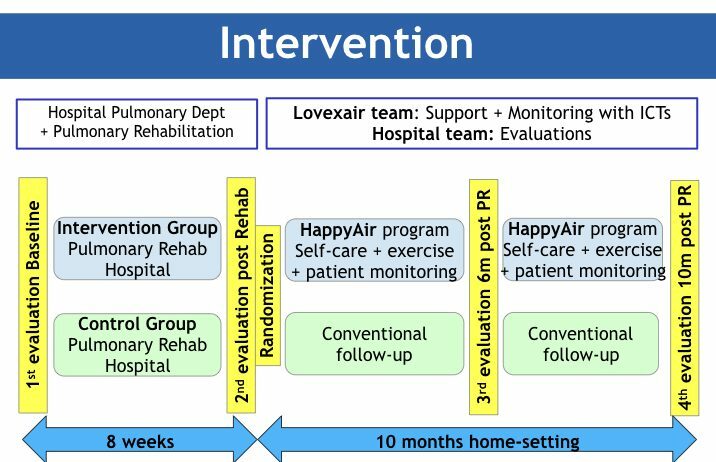 When the rehabilitation was completed the intervention group followed the Happyair m-health Integrated Care program over the next 10 month period . 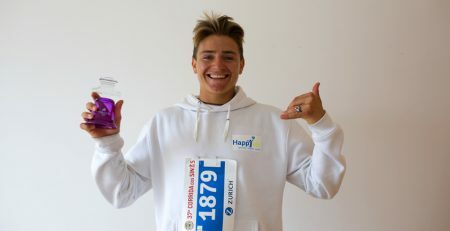 This program included using an ICT application, O2 saturation device and connection to Googlefit to monitor exercise or manual recording of data capture. Patients made a daily note of different aspects of lung-care such as use if rescue inhaler, physical exercise, warning signs on certain symptoms leading to illness. Patients had access to a Lovexair educator specialised in respiratory health who could guide and monitor the patients progress and help with any technical difficulties or issues which arise. Each group underwent 4 evaluations : at the outset, after pulmonary rehabilitation and at 8 and 12 months of starting the study. 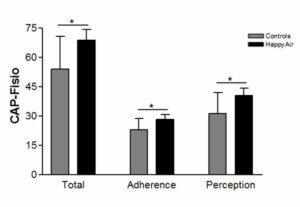 The results from the 4 evaluations indicate that the patients that used the m-health program improved their adherence and their perception about using the program is very positive compared to the control group ( no m-health or educator support). Their perception about using the m-health Happyair program and its benefits, is very positive. 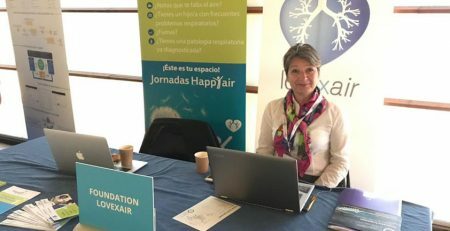 The study was closed in June 2017 with patients, family and healthcare professionals being invited to thank them for their participation, award them a diploma for having completed a self-care Happyair program, over the course of a year and to gain insights into their opinions about the service. 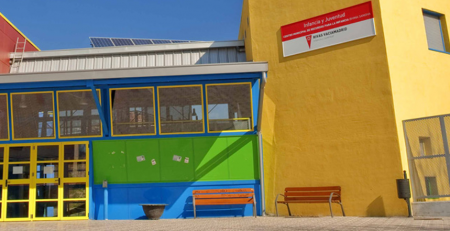 Their feedback was invaluable to our development plan and has enabled us at Lovexair to capture suggestions for improvements which we are introducing into phase II. Some of those comments are available on Lovexair YouTube’s Channel. The study has been presented at the ERS Congress, Milan 2017 and partial results were presented as poster at the COPD Conference, Chicago, 2017 and published as an abstract in the COPD Journal. The confidence and security that patients gain in this relationship ,demonstrates the value we can generate which is evidence-based, in our m-health program delivery model. This provides a sound starting point to build on in phase II Happyair . We are now in phase II production of our care model , ICT resources and its deployment. We are working on identifying phase II financing to bring in improvements and build inhouse resources in ICTs to manage this system from the Foundation. We are developing a digital health & care training program for healthcare professionals to build a network of educators. This involves collaborating with partners at key institutions , bringing in individual expertise and working with professional colleges or Universities on the development of our educational materials, course timeline and future availability. This means we can attend to patients and caregivers with appropriate educational materials and know-how for developing new skill-sets in using or understanding digital health tools, chronic disease, active lifestyles and motivation or behavioural issues in self-care. To deploy these services and develop our resource network we are already identifying partners such as SMEs specialised in ICTs, institutions, colleges, healthcare authorities and business where their is a shared interest in providing low-cost , co-financed services to those people affected by chronic and respiratory disease in the era of a silver economy. The model needs to be sustainable and involves all stakeholders. We have a shared opportunity. As a Foundation we can facilitate bringing people together in relationships to drive the process forward and to make these solutions available widely, for more users: healthcare professionals, patients and care-givers in new settings. To visualise and analyse patients’ progress from the perspective of the healthcare professional who monitors or tracks the patient journey, as an educator or collaborating doctor, psychologist or researcher. see his/her own progress and how they are managing their own goals on physical activity, social life or breaking a smoking habit. find educational support about their disease or care / activity aspects. register and attend events or activities online or offline, depending on availability in their region. 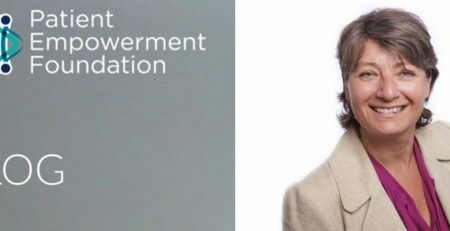 The Lovexair Foundations’ mission is to provide valuable and meaningful resources to patients, family-members and healthcare professionals: so that together we can improve our knowledge and empowerment. 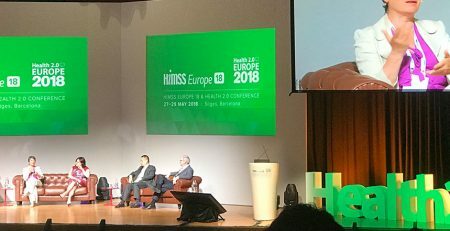 This is especially important in the era of digital health and care ,where citizens now need to learn and understand how to better manage their health . They need both resources and education in order to achieve this transitional process, to take responsibility in this role and have the capabilities to lead better lives.